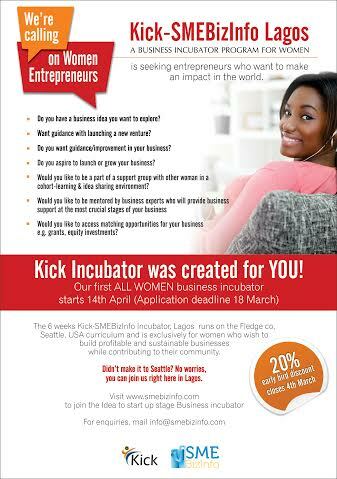 This programme runs in several cities around the world, with most of their centres in the USA and SMEBizInfo www.smebizinfo.com will be running the first all-women Kick business incubator in Nigeria starting in April. The core objective is to help you, a Female entrepreneur solve the most crucial challenges you face in either starting or running your business using a customised road map and action plan to achieve milestones that will be set at the commencement of the programme. The programme is designed to be hands on and will accommodate the needs of each business at whatever stage of operation they are in and irrespective of the industry they operate in. One of the advantages you will enjoy is the luxury of having other team members within your cohort contribute towards helping you achieve your milestones, as each business will be taken as a team-based project and you get to tap from the wealth of experience of participants, facilitators and mentors alike; while we all jointly take responsibility for the achievement of the objectives you have set for the programme. Outside the four walls of the classroom, you will have access to online materials, business clinics, mentorship from experts in various fields, post-programme support and we will also help you find matching opportunities that will give your business the leverage for growth. What’s more! You will also continue to enjoy support from this community long after the programme ended. Want to join this programme? After we have received payment, we will contact you with further information. Registration closes 18th March and programme will run once weekly (Thursdays) for 6 weeks between 14th April and 19th May). ← Previous Story Is the 80-20 principle working for or against you? Next Story → Ecobank partners EDC on the Going for Growth programme.